Looking for ideas on how to prepare a delicious meal for your family? Take a look at some of the great recipes submitted by our customers and team members. We run a new recipe in our newsletter each week and are always happy to get new ideas from our customers. So easy and so delicious! 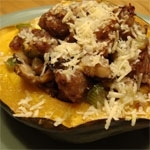 A great way to take advantage of squash in season for the fall. Delicious for dinner or as a potluck item for get-togethers, tailgating and game day parties!